By far the best car of the show at Fabulous Fords Forever this past weekend in Buena Park was what I called the Mad Max Mustang. I adored this car. Not that it was an excellent restoration, or stunning custom. It was sheer genius combining two historic vehicles into one mash up that worked here or in a Mad Max movie. The owner chopped and stretched the wheelbase of an original bronco to fit under a 1968 Mustang. Still Primer gray, and nothing else would be appropriate. The crowning touch was the inclusion of a Gatling gun. How cool was that! Of course there were ample stunning restorations and modified cars to be seen. In total there were over 1900 cars representing the start of the Ford Motor Company and included example of many nameplates from Ford, Linclon, Edsel, Mercury and 1 Cortina! More pics on my flickr album. All video and pics by me. I rarely put up a notice of an event that costs money to attend or this far in advance. But this show is big, beyond the normal car show we see here in L.A. Its the Palos Verdes Concours d’Elegance coming on September 14 at the Trump Mational Golf Course in Palos Verdes. This isn’t a cheap event, but has unique, rare and expensive automobiles. Think Cord, Auburn, Dusenberg…not Galaxy, Impala or other plebeian rides. Among the cars there will be a full size Hot Wheels Darth Vader car that was made to look like the toy car. It was unveiled at Comic con this summer and will be at this show as well. Also at the show there will be the worlds fastest motorcycle. The Gyronaut X-1that set a world record in 1966 at Bonneville Salt Flats with 245.667 MPH. Photographer J Bennett Fitts has a pretty fantastic series of images called “No Lifeguard On Duty” depicting abandoned pools around the country, many of which are in SoCal (above is from the Inland Empire). I find these image both haunting and captivating – forgotten dreams in many ways. Especially since so many of these appear to be at closed hotels, you can imagine families going on vacation and being excited to stay at a hotel with a pool – and what’s become of those now. I love these. Spring arrives with the buzzing of the bees, the blooming of the flowers and many birthings of babies. Mazel tov to all the new parents out there and to the new babies: welcome! Full disclosure: I’m not currently a mom, but I am an auntie and have many friends with offspring so I do know one thing. Those little guys grow pretty fast! If budgets are tight and you love recycling then Goo Goo Swap could be just for you. It’s sorta the Southern California Craigslist for all things kinder. There are listings for everything from toys to clothes to furniture and even listings for services like photographers and mommy and me yoga classes. There is a also section for mom’s on the nest with postings for gently used maternity clothes and exercise dvds. Goo Goo Swap looks like a good way save a few bucks (or make a few bucks) on that pair of shoes that Junior might only wear once in his easter portrait. Everyone knows that the New York Times has its chardonnay-and-ink-stained finger directly on the pulse of what’s hot in the upper-middle-class TriBeCa and Park Slope social scenes. Seriously: How would the world where to get the best organic honey in Manhattan if not for the Grey Lady? This is important journalism. And as Travis pointed out yesterday, the Times does love to take its shots at LA, which its writers (and much of the east coast) seem to believe is populated entirely by Latin Kings, the supporting cast of Beverly Hills Cop, and Angelyne (“Hollywood types?” Really, Times? Really?). But the Times redeemed its harsh words recently when it named Los Angeles #11 in the 31 places to go in 2010. Sure, it focused a bit much on our many art galleries, and utterly ignored the incredible diversity of neighborhoods, restaurants, night spots and shopping districts. And to the comment that LA has a “lack of an old-fashioned cultural neighborhood,” I’d point our friends at the Times to Chinatown, Little Tokyo, Little Armenia, Little Ethiopia, Boyle Heights, Los Feliz, Thai Town… well, you get the idea. Sure, we may have absolutely no culture or history whatsoever when you compare us to The City That Never Sleeps Because It’s Too Busy Constantly Reminding Us How Totally Totally Awesome It Is, but we make do. But we’ll take it as a compliment that our turtleneck-wearing friends to the east seem to think that our hopeful little hamlet is worth a visit. Here’s to ya, New York Times! Thursday night, the 2009-2010 College Football Season culminated in the National Championship BCS Title Game, held right here at the Rose Bowl. Though I don’t have connections to either Alabama’s Crimson Tide or the Texas Longhorns (besides my unreasonable dislike towards the Longhorns), I decided to drop a sizable chunk of change and attend the game. I didn’t have to travel; they brought the game to me, so why not? Photo by me! I even upgraded from my usual cell phone camera for this special occasion. Thing is, much like the Rose Parade last week, I’ve never gone to the Rose Bowl as just a spectator, either, so it was a completely new experience for me. I went crazy taking pictures inside and outside the stadium and reveling in the gorgeous weather and how easy it was to simply walk there from Old Town Pasadena. But as I took in the tailgating scene and then settled into my seat for the game, I realized… I was, like, the only person who actually lives here. That’s a slight exaggeration, of course (I’m pretty sure I did see Jason Schwartzman. He’s an actor, he does live here, right?). I’m sure there’s Alabama fans in LA, and there are tons of Texas alumni in this town. But damned if I wasn’t surrounded by a bunch of tourists the entire night. The people I sat near were dudes who flew in from Austin, people who possessed awesome/ridiculous Southern accents, or were the brothers (one a Crimson Tide fan, one a Longhorns fan) who drove up from San Diego. SoCal’s Big Bowls Not Only In January – How About This Weekend? It’s good to know California’s high school athletes are being properly prepared for college. At least, they’ll be prepared for college football’s broken, convoluted system of determining a league champion, the Bowl Championship Series (more commonly known as the BCS). Many of our state’s most promising young athletes will converge on the Home Depot Center in Carson this Friday and Saturday for the California State Football Championship games (proudly representing Los Angeles will be undefeated Crenshaw – Go Cougars!). But for 80 years, California didn’t even crown a state champion in high school football. It wasn’t until 2006 that the California Interscholastic Federation (CIF), the state’s high school sports governing body, created a small “bowl” system in which some of the best teams play each other for championships in four divisions (determined by school enrollment). And this year is the second the top two teams from all divisions will play each other in an “Open Division” bowl to determine who’s the greatest in the Golden State. However, with such a limited numbers of bowls, not even all Section champions get to play in these big games. Unlike other large states like Texas or Florida, or, well, any other state in the union besides New Jersey, there is no state playoff in California. And, just like in big-time college football, not everybody’s too happy with that. Yet, none of those teams will play one another under the format that matches section champions from Southern California and Northern California. A proposal to add a regional playoff round was shot down last year by the California Interscholastic Federation’s state federated council. It’s that time of year again. The 2009 LA County Fair took advantage of the Labor Day weekend to open its doors. Opening Day is always exciting because you get to see everything so fresh. 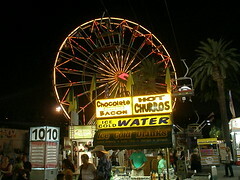 The fair will run until October 4th, so you have plenty of time to pick the best day to visit. The Fair is offering $1 admission Sept. 5 – 7 between 10am and 1pm. That means, tomorrow is your last chance to take advantage of this deal. Throughout the park, there are other cost-saving deals for the Labor Day Weekend, such as $1 fountain drinks between 1pm and 4pm and $1 carnival rides between 4pm and 7pm. This year, we spent a lot less time eating and drinking and more time walking the fairgrounds. I’ve only missed 3 years since 1984, and used to go up to 3 times a week in college. This was the first time I had realized that there is an NHRA museum and a train museum run by the LA chapter of the Railway & Locomotive Historical Society on site. Be sure to check them out. The NHRA museum has $1 entrance and with so much to look at, including the original Batmobile from the 1966 Batman TV show, it’s well worth it. Also, worth catching is the Jursassic Planet exhibit (I have video in my Flickr photos linked below). It’s educational and just plain cool watching the dinosaurs move. If you have young ones, they may want to stay outside the hall. My three year old did not enjoy being in there and most little kids did a lot of screaming. As always, the new baby animals are a treat as are all the wonderful insects and reptiles on display in three different sections of the fairgrounds this year. The Home & Garden theme this year is Gateway to Africa and even I have to admit to being impressed. This is the first year in a long, long time that the theme was unified and tight, from the greenhouse all the way to the top of the hill. So, wear some comfy shoes, get some sunscreen and have fun at the Fair. If you want to live vicariously for the moment, you can visit my flickr set. Patriot Guard Rider, honoring a fallen hero. Photo by Burns! 1. Show our sincere respect for our fallen heroes, their families and their communities. I first learned of the PGR when researching Fred Phelps’ Westboro Baptist Church (most famous for being the Christians hateful bigots who carry signs that say “God hates fags.”) It turns out that Phelps & co. also protest military funerals with signs such as “God loves IEDs” and “God loves dead Marines.” Can you imagine anything more hurtful to a grieving family? You don’t have to ride a motorcycle. Join me after the jump to learn more about the PGR and how you can get involved.